Poseidon is one of the playable Gods in SMITE. Deep beneath the turbulent tides of the ocean lingers a God of idle rage. What must it be like to live forever in the shadow of your brother? To be denied again and again that which you desire, despite the power of the wrathful seas at your command? So Poseidon broods on his throne at the ocean floor. As a child, Poseidon and his brother, Hades, were consumed by their father, Cronus. Powerless to escape, it was left to mighty Zeus to free them and slay their patron. Together, they defeated the last of the Titans and ushered in a new age of dominance for Olympian Gods, but their freedom, their very lives, Zeus would never let either brother forget were owed to him. Even as the heavens, the underworld, and the seas were divided among them, Zeus positioned himself as king of all, and what was Poseidon to do but be thankful he had been spared a fate in his father’s belly? So he retired to his new realm and began the pursuit of gathering worshippers. Soon rose a great ocean front city of mankind, and Poseidon presented himself as their God, but another had already come, Athena, Zeus’ daughter. A competition was held – each God would offer a gift and the people would select their sponsor. Confident, Poseidon drove his Trident, a trophy from the battle against the Titans, into the ground and a limitless spring emerged, but the people found the water salty and undrinkable. Athena extended her hand and a graceful olive tree rose from the earth. Wood, food, and oil, all from one gift. The people decided and the city was called Athens. It may be that Poseidon never desired greatness as Zeus did. Had his father never consumed him, had he never been made God of the Sea, had his brother never crowned himself King of the Gods, Poseidon might have lived contentedly, but that chance is gone. Now, with the very tides at his command, an army of sea beasts at his back, and the formidable Kraken at his call, the glowering God of the deep seeks to quench his thirsty rage and plunge all the world in endless, wrathful seas. Can deal up to 90/150/210/270/330 (+90% of your magical power) damage. Ultimate - Release the Kraken! Has a knockup height of 375. Deals a total of 350/420/490/560/630 (+90% of your magical power) damage to enemies in the center. Poseidon along with his brothers Hades and Zeus are the great three olimpian. In March of 2017 Poseidon received a remodel, changing his default, earthshaker, London Conspiracy and Mastery skins, his Dreadbeard, King of the Deep and Poolseidon skin remained unchanged. Poseidon was a free starter character for every new player account created between July 10, 2013 and October 1, 2013. He was replaced by Guan Yu, a change made so that new players would own one god of each class. 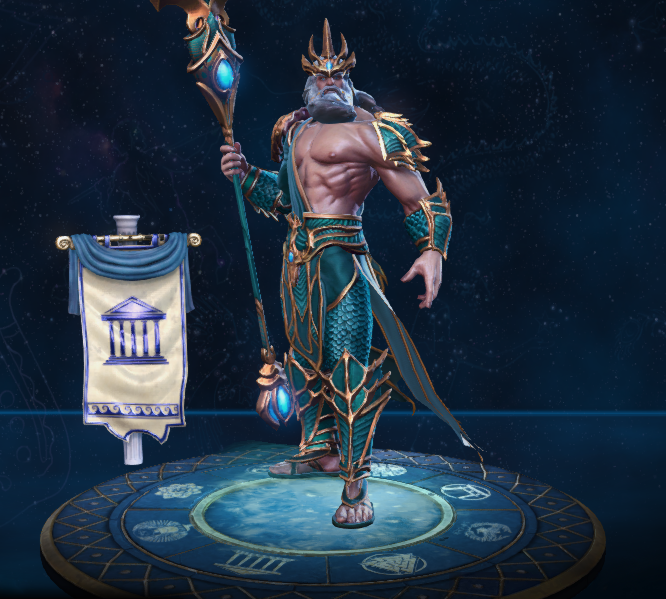 Poseidon's ultimate ability features the sea monster the Kraken. The Kraken is actually a Norse myth while Poseidon is a Greek god. However, this is most likely a reference to the film Clash of the Titans wherein Poseidon summons the creature with the same quote, "Release the Kraken!". Reaching player level 2 previously granted a 7-day Poseidon rental through the Player progression system. However, this has now been replaced by permanently unlocking Chang'e and Hou Yi. 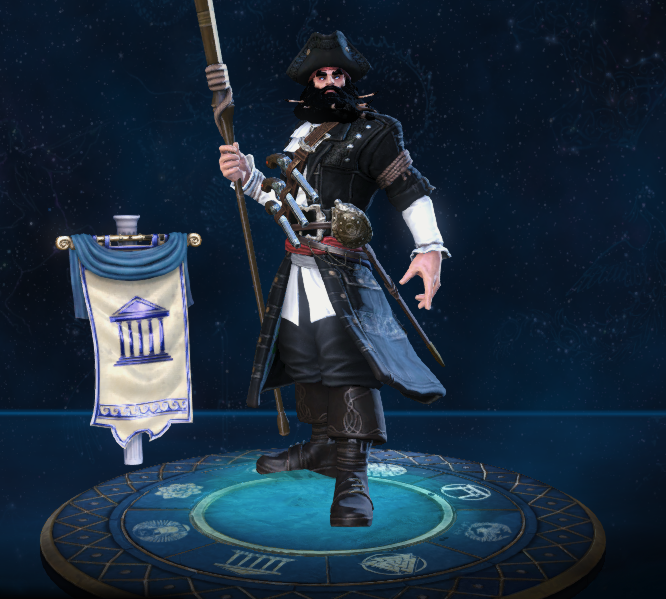 This skin is based on a Pirate. 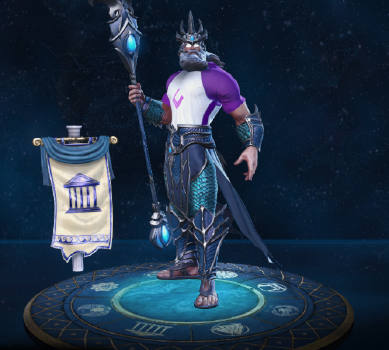 This skin share its theme with Skaliwag Kali, BuccaNeith Neith, PrivaTyr Tyr, High Seas Sobek, Swashbuckler Susano and Vulcap'n Redbeard Vulcan. This skin could be a reference to the french writer Jules Verne who is famous for the book Twenty Thousand Leagues Under the Sea. This skin draws a lot of it inspiration from Maori culture. This skin share its theme with Freaky Tiki Ah Puch and Fire Dancer Xbalanque. This skin is based on several elements from the 90's. This is one of the few Poseidon's skins that are not water related. More specifically this skin is based on the creature Nyarlathotep. 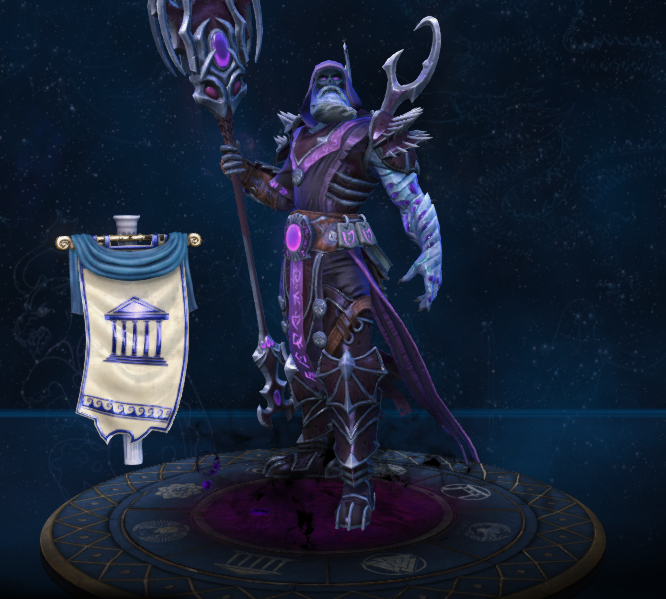 This skin share its theme with Abyssal Acolyte Agni, Dark Whisperer Ah Muzen Cab, Abyssal Knight Ares, Abyssal Executioner Chaac, Eldritch Ra and Abyssal Warrior. The sale for this skin were to raise the SMITE Launch Tournament's prize pool. 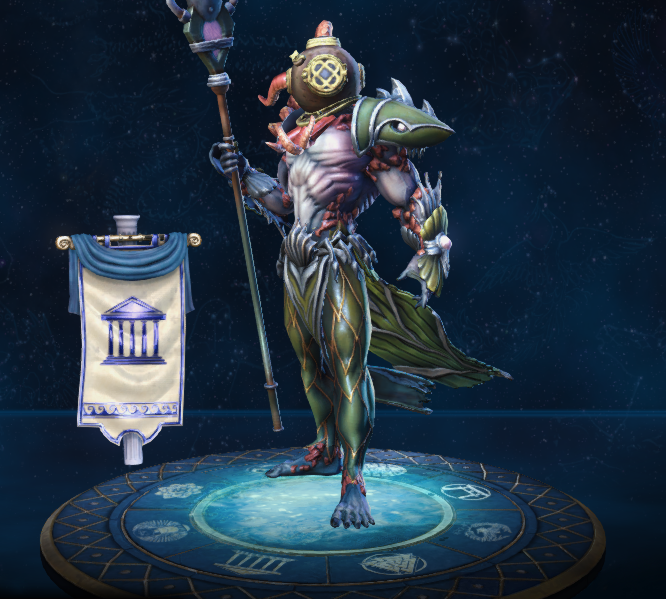 This skin share its theme with Sun Kissed Amaterasu, Beach Babe Aphrodite, Life's a Beach Geb, Hunkules Hercules, Poolparty Jing Wei, Chef's Special Khepri, Challenger/Ace Nu Wa, Land Shark Sobek and SPF 666 The Morrigan. 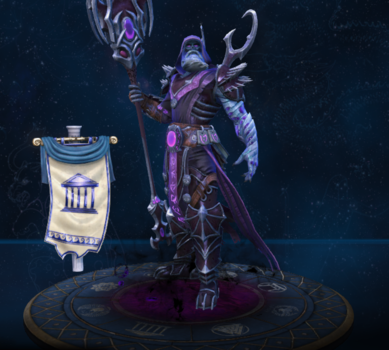 This skin was only available until March 25, 2014 and was sold to raise the SMITE Launch Tournament's prize pool. Fixed an issue with Tidal Surge's moving deployable which caused its collision height to be shorter than intended. Normalized the knock-up height of this ability from 300/325/350/375/400 to 375 at all ranks. 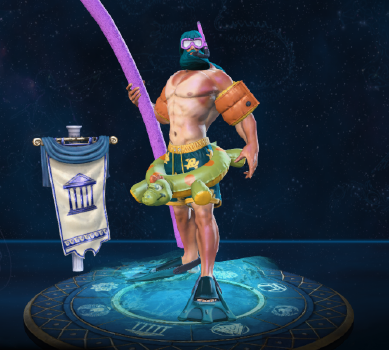 Poseidon should now be able to hit an enemy knocked up by Release the Kraken with Tidal Surge. Decreased Tide cost from 30 to 20. Decreased Tide cost from 50 to 30. Increased Movement Speed 5/10/15/20/25% to 10/15/20/25/30%. Updated Base Model and Base Card Art for Poseidon. Updated Recolor, Mastery, and London Conspiracy eSports Skin and Card Art. Reduced the pre-fire on this ability so players can immediately fire a basic attack without waiting for Trident's animation to finish. Reduce Mana cost from 70/80/90/100/110 → 60/70/80/90/100. Reduced Tidal Meter Cost from 35% → 30%. Reduced Tidal Meter Cost from 25% → 20%. Fixed an issue where he could pull the Fire Elementals out of the Fire Giant Pit. Fixed build up sound fx not playing correctly on Dread Beard skin. Improved team coloring for Kraken. Fixed Trident debuff icon showing on enemies instead of Whirlpool. Legendary skin basic attacks no longer play the hit effect if they miss their target. Reduced movement speed bonus at max Tide from 20% to 10%. Reduced movement speed bonus from 15/20/25/30/35 to 5/10/15/20/25. Fixed an issue that would sometimes result in the wave not being visible. Fixed a rare issue that could leave an enemy crippled until death and respawn. Poseidon's Tide meter no longer falls off gradually over time. No longer consumes Tide when cast. Reduced post-fire time from 0.5s to 0.1s. Reduced post-fire time from 0.5s to 0.3s. Fixed an issue in which Poseidon’s Trident was not dealing magic damage to the middle shot. Poseidon was incorrectly gaining .6 magical protection for each level. That has been removed.